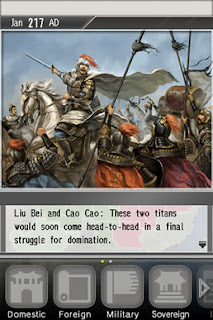 Romance of the Three Kingdoms Touch – for iPod Touch and iPhone!! Wow talk about exciting news for fan of the ROTTK series. After spending hours of my teenage life playing ROTTK, I’m very intrigued by the idea of it being a portable game on my iPod Touch. Koei’s newsletter announced this latest in the long line of Romance games along with a host of new features including; new maps, intuitive touch controls, and 255 characters to choose from and recruit. Get ready to recruit your team of officers from across the land and vanquish your enemies! For more information, visit the official minisite. Not familiar with the series, but looks interesting! So many crappy Ipod/Iphone games. A reviewer on the app store says it's solid, with 5-start potential, but that it's unbalanced. I'll buy it if it's patched. Romance was one of my favorite RTS titles growing up – it's hard to find now but if you get the chance I'd recommend you give it a try. It's an RTS? Thought it was turned based because of all the squares.. A turn-based game I absolutely adored is HOMM3. Ever played that? 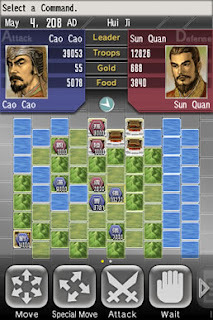 ROTTK comes complete with army and resource management, citizen index, town management and diplomacy… add to that a turn based fighting system and some one on one battles between your generals and the opposing generals. The last HOMM game I played was HOMM II. I just never went back to it after that, no real reason why just stopped playing – likely for other titles.